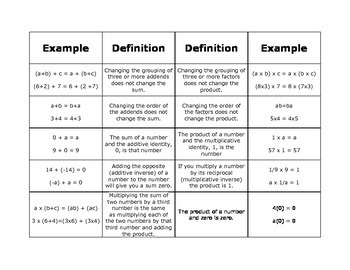 This is a mathematics number properties fold-able I created for my 8th graders. You will need to print it and copy it double sided. You may need to make a few copies to get it right. The pages will need to be right side up. 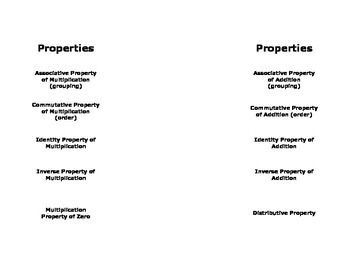 Once you have it copied double sided, you will cut around the table of properties (the side with the lines). Fold the outer two columns in to make a "shutter fold". You will then cut the rows in to the fold to create "flaps". If you have it done properly, the flaps will open up to the correct definition as well as have an example on the flap.